Size: Select Size18" x 16" x 21"
Wooden Carved Teakwood Temple, Teak Wood is one of the tropical hardwood birches, included in the family Verbenaceae. Teakwood carved temple exquisite hand-carved figurine depicts a unique manifestation. Teak wook temple has been expertly hand-carved from carefully selected teakwood and transformed into a beautiful work of art by deft artisans. You can recognize the mastery of the craftsman that is derived from an ancient Indian art form. The beautifully sculpted temple is polished to a high sheen. Teak Wood Hand Carved Temple, Every Single piece of wood is completely hand carved not only carved but by some orginal german paint color/polish. From front you can see the three different section of that temple, It's look like a heaven. It is available in standard size as well different size as per the need of the customer. This color and polish applied to the temple does not subside the natural figures of the wood but gives a light shining finish which enhance the beauty of the Temple. 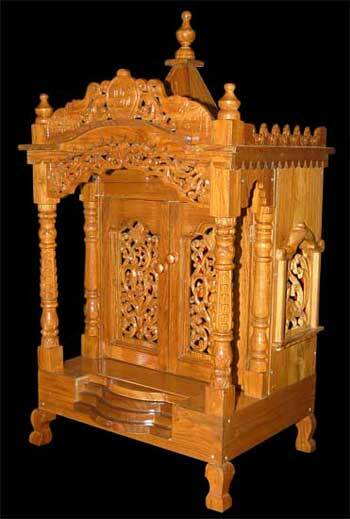 We are leading manufacturer & exporter for teak wood temples. Our teak wood temple, mandir are individually hand-crafted on a custom basis. The products you see displayed can be ordered as shown or customized to suit your needs and decor. We would delighted to provide you with a custom quotation.